Isaan (อีสาน; also Isan, Issan, Isarn and even Esarn), Thailand's north-east region, is an often overlooked part of the country. There's no coastline, so there are no beaches to draw those seeking sand and sea. Isaan, however, is a multicultural area where Laos, Cambodia and Thailand meet, and has a rich history. 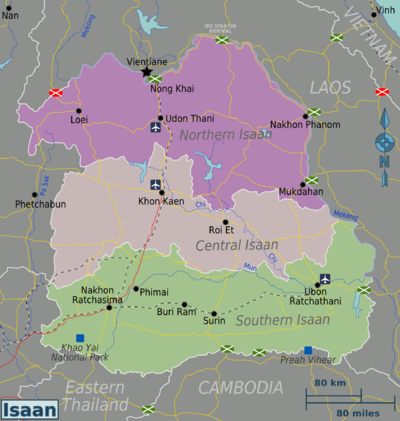 Isaan is mainly an agricultural region. The great Mekong Valley, the national parks of Loei, Ban Chiang, Nong Khai, Wat Phra That Phanom, etc. Also known as the Chi River Basin, the highway from Bangkok ends here in Khon Kaen. Centred around the chaotic Nakhon Ratchasima, the Mun River Basin is home to Khao Yai National Park and the beautiful Khmer architecture of Phanom Rung and Phimai. Yasothon — famous for growing high-quality jasmine rice and for the largest Rocket Festival in the region. Isaan is a wonderful part of Thailand to visit if you become tired of Khao San Road, one temple after another, or lounging on a beach. Isaan, known as Thailand's 'rice-bowl' is a very agricultural region with a slightly different, more laid-back culture, wonderful, warm people and even has it's own language and cuisine. The relative isolation and underdevelopment of the area means that Isaan is a good place to get off the beaten track and discover Thailand's agricultural roots and natural scenery. Not to mention that the people of Isaan are warm, friendly and always like to meet a foreigner! Just be aware that this is not a path well-trodden by tourists, and if you cannot speak even a few words in Thai, daily activities can become a chore quickly. Remember that few Thai people are fluent in English, and in Isaan things are even worse! But if you do make the effort, you will be rewarded with some breathtaking scenery, very interesting food, and people who have a heart of gold. Also of note is that Isaan is cheap! Think $70-80 to rent a family home for a month in a village, and som tam for $1-2, and this could be your heaven! Isaan people are kind-hearted, generous and welcoming. If you eat some of the food they offer you, then you will have friends for life! Any Westerner who makes the effort to travel out here will surely remember it for the rest of their life, there are not many places on Earth where you can find such kind-hearted and genuine people. You can meet families who are living on a few dollars a day, but they will still welcome you as a foreigner into their home and share what little food they have with you. Many Isaan men also like a drink after a hard day's work, but take care if you partake as they often consume very strong stuff which would probably not be allowed in your home country. Be warned, that if you are the kind of travellers who loves to pack in loads of activities, Isaan probably isn't for you. It's more suited to the kind of person who likes to relax in a hammock with a cold beer for the afternoon, whilst watching the world go by. It is mostly very rural, and not touristy, but you can find some incredible waterfalls, temples and parks if you are willing to rent a car. Just don't expect anyone to be able to speak English. It can be cold (as low as 15 Celsius) during December till February and can be very hot (up to 40 Celsius) around April till July. Rainfalls mostly occur around July till late August. While the national language Thai is used in schools and thus well-understood, the local Isaan language, which is a dialect of Lao, is predominant. Khmer is also widely spoken in areas near the Cambodian border. Although the person you meet in the market might speak little or no English, it's more likely than not that they are already bilingual or multilingual. You may have gotten by through your travels using English, but here it will not be well understood. However, all Isaan people can understand standard Thai, so learn a few words and phrases or download an app to your phone, and you will be able to enjoy this wonderful corner of the world. The cities of Buriram, Khon Kaen, Loei, Nakhon Phanom, Roi Et, Sakon Nakhon, Ubon Ratchathani and Udon Thani can be reached by plane from Bangkok on several airlines. If you want to go directly to Nong Khai, then take a plane to Udon Thani. Every plane is met by a minibus service (tickets available in the arrivals hall - 200 Baht) and will take you straight to Nong Khai in 1 hour. It will bring you straight to your hotel if you ask the driver. Frequent bus services go everywhere. Regular train services connect Bangkok with Ubon Ratchathani (via Nakhon Ratchasima, Buriram, Surin, Si Saket and other stations along the way) and Nong Khai (via Khon Kaen, Udon Thani, etc). Depending on where you're coming from and where you want to get to, buses, minibuses, songthaews, motorbikes, and bicycles are all good ways to get around. The train system is also a good way to get around, however the number of locations served is limited. Fishing is also a popular pastime here, and many larger towns may have a stocked lake for sport fishing. The prices of rods, reels and tackle here are very low, in fact you can easily buy everything you need for a day's fishing for around $20, plus there is no license required. Most Isaan towns and villages will have a market where you can buy various items of clothing at rock bottom prices. The quality may not be great, and the English words on the t-shirts are often misspelled, not that many people notice. All manner of handicrafts are available, including intricate rice baskets handmade out of rattan/bamboo which are very cheap and make a nice souvenir. Isaan cuisine borrows heavily from Lao cuisine and is distinctly different from central Thai cooking, although there has been a considerable amount of cross-pollination. Perhaps the best-known Isaan dish is som tam (or tam mak hung in Lao/Isaan), a spicy salad prepared from unripe papayas. While Thais prepare this with dried shrimp, in Isaan the preferred style is with preserved crab (puu) or mudfish, an acquired taste. Other characteristic dishes include roast chicken (Gai yaang), sticky rice (khao niaw) and a wide variety of cold meat, mint and lemon juice "salads" known as larb. A word of warning: Isaan food is known even among Thais for being fiery hot! Avoid the raw fish dishes, as there is a high incidence of liver parasites which give Thailand one of the highest rates of liver cancer in the world. And you should be aware that even though in Bangkok you had some sensational foods, things are different here. Meats are served in an insipid, cold, grey broth with sticky rice and are likely to be very unpalatable for the average Westerner. Freshwater fish features heavily in the diet, and if this is not taste which you are accustomed to, it can be very nasty. Isaan people also eat carrion, rats, mice, frogs, small birds and anything else that they can get for free. By all means give them a try, but in Isaan nobody would ever eat a steak and chips! Do not expect to be able to get any Western foods outside of the major towns and cities. There is a huge difference between the food you would get in a restaurant, and the food that Isaan families eat every day. As everywhere else in Thailand, eating is very much a SLOW and social occasion, with all dishes being shared between the guests. The main drink in Isaan is a wonderful spirit which combines orange juice with chilli peppers and rum. It is a must for all visitors. The drink is called kaw nam lac. You are also very likely to witness locals drinking a spirit called "lao khao". To the Western palate, it is hideous and tastes like gasoline smells, but at under $2 a bottle, who cares? As it is produced under dubious conditions, it contain many aldehydes and ketones and will give you a terrible hangover! Local and imported beers are available from many places for reasonable prices, if you are invited to a meal, try and take a few extra bottles and have friends for life, locals generally go for Leo beer. Do not be surprised if you are invited to a "party" at 8am - things like wakes, wedding parties and birthday parties are often undertaken between 8am-12pm in Isaan. Consider it an honour if you are invited to such an occasion, and expect a few stares and people trying out their English on you (just remember that many people have a poor standard of spoken English but do your best). And yes, people will be getting drunk at smoking at that time! If you fall in love with the region and want to stay longer, you could even rent a small house or apartment. In a quieter village, prices can go as low as 2000 baht per month! Just make sure that you do not overstay your visa under any circumstances! Parts of the Cambodian border, mainly near Preah Vihear, are occasionally violent as Thai and Khmer soldiers occasionally shoot at each other. Watch for potholes in the roads - if you don't see them you could have an accident. Also be careful of what the locals call 'Da-Karb' which means giant centipede. A bite will be excruciating and you will need to go to the hospital. If you see one, do what the locals do and run away! The 'lao khao' is the thing which is most likely to affect your health - anything more than 2 shots is suicidal unless you are used to poorly produced extra-strong spirits. It can, and will hurt you the next day, mark my words. If you take medication, ensure that you have enough with you. The pharmacies in some smaller towns may not stock your medicine, especially if it something a little more obscure. You may see many stray dogs wandering around, and even going into shops. They are fairly harmless, do what the Thais do and ignore them and you will be fine. Police here are reliable and generally not corrupt, although they will almost certainly not be able to speak a word of English. If you cannot speak any Thai, at least download a translation app to your phone which you can use in an emergency. If you intend on having sexual relations, take extreme care as rates of HIV and STDs are much higher than in Western countries, as of 2018 there still does not to appear to be any kind of screening program. As this is a poorer region, with little employment opportunities for some people, young girls may travel to Bangkok for work in some of the seedier professions to support their families. Some Thais can be very promiscuous indeed and a lifelong disease is probably not the souvenir that you were looking for. Many Isaan people still hold very antiquated ideas and beliefs, indeed if there is stormy weather many people still like to turn off electrical appliances, including mobile phones. There may be some sense in this seeing as many buildings are not electrically earthed. Some folk also still believe in magic, ghosts, and witchcraft as per Thai cultures and traditions - just go with it as trying to explain that such things do not exist will get you nowhere fast. This page was last edited on 20 April 2019, at 07:49.